A former state legislator is heading up a “Draft Branstad” effort to encourage former Republican Governor Terry Branstad to run again in 2010. 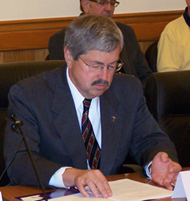 Terry Branstad served 16 years as governor and left office in January of 1999. There’s now a “Draft Branstad” Twitter account , a Facebook page and a website. The website features a minute-long video showing only four pictures of the modern-day Branstad, but there are 14 snapshots taken of Branstad during his time as governor.